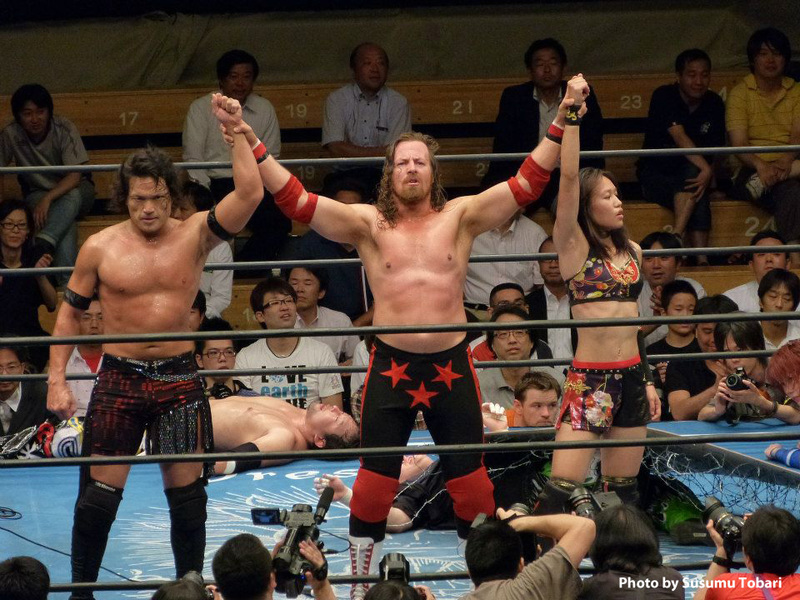 Having just returned back home an hour ago from my last tour of Japan with Wrestling New Classic, I can now sit back and reminisce on a very memorable jaunt … and I say memorable for a few reasons. In a major surprise, my old MMA buddy Joachim “Hellboy” Hansen from Norway showed up with his girlfriend at Korakuen Hall in Tokyo to watch me fight and to say hello. It had been the summer of 2009 that I saw Hellboy last in Oslo, and he happened to be training in Japan when I was there, so he made plans to come see my match. Hansen is a great guy and one hell of a fighter, so check him out on YouTube if you are not familiar with him. He is known as “The Japanese Killer” in the Land of the Rising Sun, because he has beaten so many of the Nippon best out there over the years. 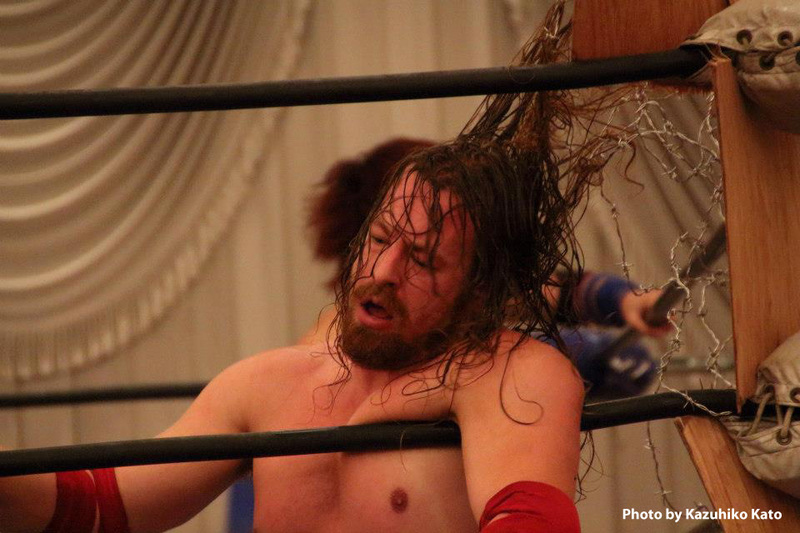 Firstly, I wrestled the first barbed wire matches of my career in Japan this time around, and I must say that the danger aspect of these kinds of bouts is off the charts. The main objective of any rational wrestler in one of these matches is to stay away from the barbed wire as much as possible, yet at the same time trying to run your opponents into the same structure. It can be a very tricky and vulnerable scenario, and over the course of the tour, every single of the combatants in these intense matches got scarred and wounded, the girls included. My team with AKIRA and Syuri defeated the team of TAJIRI, Mikey Whipwreck and Kana in both Tokyo on August 30th and Osaka on August 31st in said barbed wire warfare, but on September 1st in Toyohashi, our team fell to our adversaries when I was thrown by my opponents into the barbed wire board positioned in the corner of the ring, and my hair got entangled in the wire. The story of Absalom, son of King Salomon in the Bible came to mind, when he rose up in defiance against his father and God struck him down in the battle of Ephraim Wood when he rode his mule into battle: Absalom, decked in long tresses of hair, rode his steed underneath an oak tree in the melee, and his locks got entwined in the branches, wherewith he was hung to death. In the Toyohashi match, as I attempted to finish off Whipwreck with my trademark piledriver, TAJIRI hit me with a blindside high kick, after which he nailed me with a side thrust kick to the temple that jarred my neck. I was a sitting duck after that incident, as our opposing team laced into me with kicks when I was down, and then proceeded to flail me into the barbed wire board in the opposite ring corner. Not only did the board splinter and break upon my body crashing through it, my hair got wickedly entangled in the steel wire barbs, causing even more strain on my injured neck when my frame slumped down after the impact. Whipwreck then added the final coup de grâce, hitting me with a stunner for the academic pinfall and consequent first loss for our trio in Japan to date. I will not have to take a few weeks off to properly heal my neck, but you can rest assured that there will be retribution and a day or reckoning in store for TAJIRI when I return to action in Japan the next time! 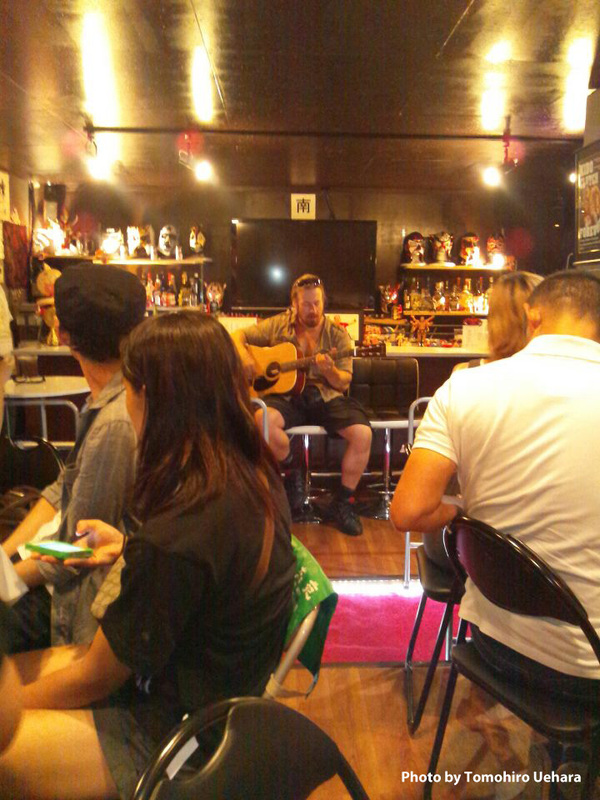 In Osaka, AKIRA, Syuri and I held a special afterparty for the WNC fans at Wrestling Bar 2.99, where I performed an acoustic number for those on hand, which was received warmly. 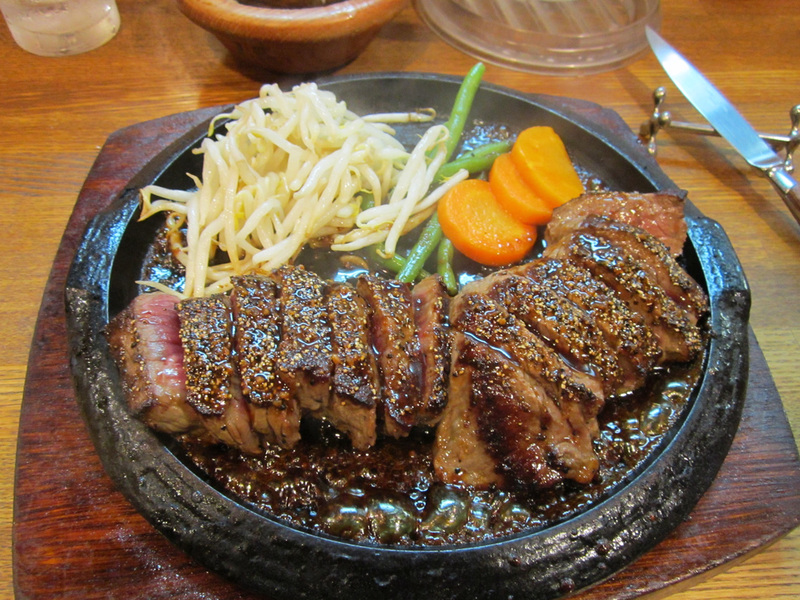 It was also in Osaka that I went out after the event to eat at the famous Cowboy Steak House with AKIRA, where we were treated to some of the finest beef that I have ever sunk my teeth into. Kudos to the friendly staff at Cowboy for sponsoring our meal! 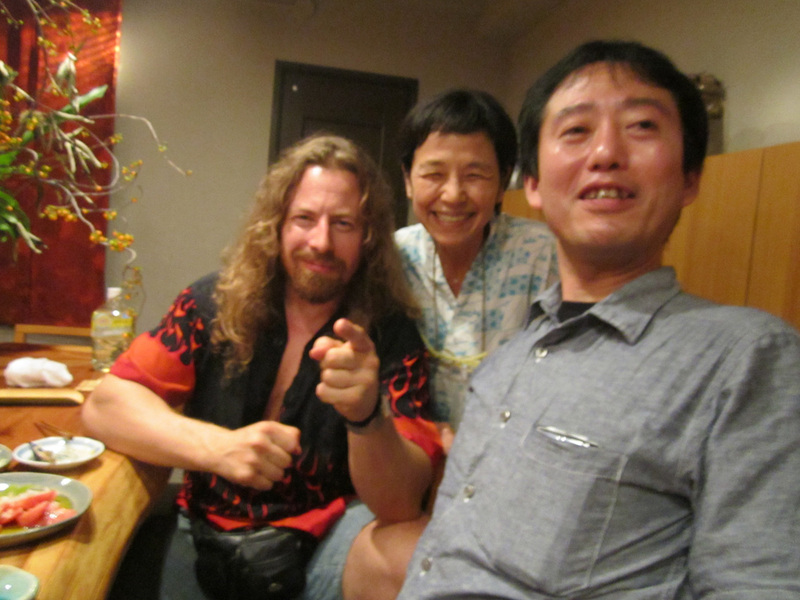 My good friend Dr. Hiroaki Terasaki also took me out to eat at a fine restaurant, run by one of his long-time friends, seen in the photo below. Terasaki-san also introduced me to the editor of Tokyo Sports newspaper at lunch yesterday, and I will soon have some big news coming out of that meeting, so stay tuned to my website for more infos shortly!